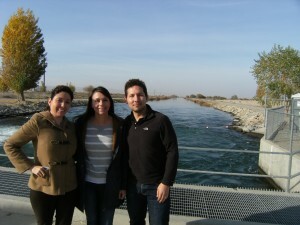 Ana Lucia Garcia Briones (left) joined colleagues for a visit to the Kern Water Bank in Bakersfield, California, which uses California’s groundwater space to store 1.5 million acre feet of water and retrieve it when account holders need it. On World Water Day, I am reminded of what brought me to the Environmental Defense Fund: a passion for working on market-based incentive programs to improve groundwater management in California, ultimately benefiting multiple, diverse communities. Born and raised in Mexico City, I moved to San Francisco to work on drought-related problems in California. It has been a surreal experience, allowing me to help disproportionately impacted communities, many of which are poor Latino communities in the rural Central Valley, where most of the nation’s fruits and vegetables are grown. In this way, I feel a little bit closer to home. Many people may not realize it, but only about 5 percent of usable water in California is visible; the rest is underground. With access to surface water curtailed because of a five-year drought, many of the state’s biggest water users – farms and cities – have relied on groundwater pumping as a last resort. This has drawn down aquifers to dangerously low levels, and has left some rural communities without any water at all. A new law passed in 2014 will require 127 groundwater basins in the state to come up with sustainable groundwater management plans by 2020 or 2022 (depending on how dire the conditions of the basin are). I am helping to give disadvantaged communities a voice in the process. In the meantime, EDF is supporting legislation to streamline California’s water laws in ways that promote water sharing. We want to free up as much surface water as possible, so it can quickly be made available to those who need it most without draining groundwater resources. Ana Lucia Garcia Briones came to EDF as a Tom Graff Diversity Fellow and is now a full-time member of EDF’s California groundwater team. Watch this video to learn more about her experience as a Tom Graff Diversity Fellow. With better laws that increase the efficiency of water transfers, we can help bring some environmental justice to these communities who have suffered disproportionately from the drought. Water moves through complex, interconnected systems that cross borders and provide multiple uses to various communities. Supporting everything from fish to farms, California’s water systems can offer lessons to the other water systems of the world – especially in arid regions that are expected to get drier because of climate change. It is a personal passion of mine help share these lessons, writing cases studies and promoting water models that can benefit other communities – in California and beyond. Maybe someday I can bring these lessons home to Mexico, where agriculture and conservation groups are working to overcome some of the same challenges we face in California. For now, I feel incredibly fortunate to be able to work for a program and organization that is dedicated to helping people and nature thrive in these water-stressed times. Despite drought, California agriculture is doing well. But there are hidden costs. This entry was posted in ecosystems, Partnerships, Sustainable Agriculture, western water and tagged california, central valley, climate change, drought, environmental justice, groundwater, kern water bank, mexico, water banks, water law, water sharing, water use. Bookmark the permalink. Both comments and trackbacks are currently closed.